Waiting has come to an end - this exceptional vanity bag from the German premium leather manufacturer Alpenleder is now available in the United States! This luxurious and timeless tobacco pouch is the ideal companion for the modern gentleman. Every detail is the result of pure, carefully performed handwork. Produced by using high quality pull-up buffalo calf leather which has been elaborately finished with hard wax in order to give the leather its unique character, this tobacco pouch is certain to be a conversation piece everywhere you go. A high-quality rubber band makes it easy to close the tobacco pouch securely. Moreover, it features a separate pocket for cigarette paper. Finally, a high-quality, entirely rubberized interior lining ensures that the tobacco will always keep its original taste and freshness. Perfect Dimension - The tobacco bag has the right dimensions to fit in every handbag: Height 3.1 x Length 6.3 x Width 0,08 inches. Guaranteed Freshness - The interior of the tobacco pouch is completely rubberized and guarantees that the tobacco stays fresh. The tobacco bag is also 100% smell free and can be closed with a strap. Exceptional Quality - The premium bag is made of high quality full-grain buffalo leather. 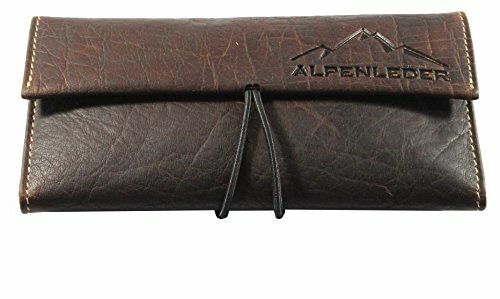 ALPENLEDER is based in Germany and makes every item by hand. Pocket for Papers - The pouch is ideal for tobacco for pipes and rolling cigarettes and chewing tobacco. It has a seperate pocket for the cigarette papers. Timeless Luxury - Add a touch of class to the daily routine. The premium leather tobacco pouch for cigarettes and other products has a soft feel and a classic look. If you have any questions about this product by ALPENLEDER, contact us by completing and submitting the form below. If you are looking for a specif part number, please include it with your message.